I love scallop recipes and this one will quickly become one of your favorites. This is a lovely scallop sauté, very quick and easy to make. A perfect easy dinner recipe for any night of the week. In the same skillet, combine the lemon juice, butter, parsley, salt, paprika, pepper, and garlic. Cook, stirring until the butter is melted. Pour over the scallops. Bay scallops will work if you can’t get sea scallops, but the sea scallops are much better for this recipe. 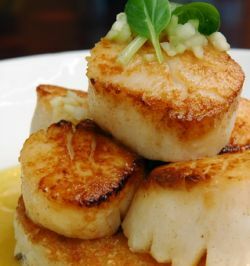 If using sea scallops, you can cut them into thirds or quarters if you prefer. I like the look of the whole scallops on the plate. Of course scallops are not the most budget friendly dinner entree. You can choose to substitute bay scallops for the sea scallops called for and they will still be delicious. The sea scallops are much more tender though and quite a treat. This is a perfect seafood recipe for entertaining. It is also a great gluten free, low carb and diabetes recipe. It suits a lot of restrictive diets quite well. You can easily multiply the recipe to serve as many people as you need and it cooks up quickly, so no need to be in the kitchen all evening when you have guests. You will find more shrimp and scallop recipes here.